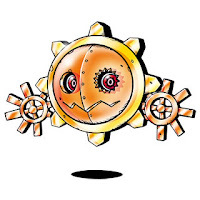 The Digimon Reference Book profile for October 30th, 2015, is Solarmon. A translation is provided below; you may use it freely on forums, wikis, etc. so long as you link back to or cite back to this page. Profile: A Machine-type Digimon of a rare species among the mechanical series. Although among researchers it is said to possibly be a mutation of Hagurumon, the truth is shrouded in mystery. Because of its Digicore generating heat, its body can become scalding when it gets too hot. 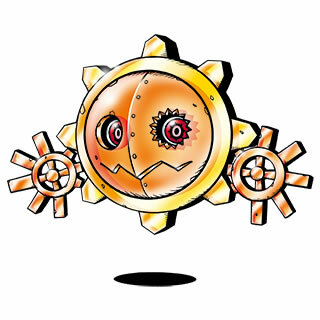 Its special move is to fire a gear that emits incredible heat and burn the enemy, "Shiny Ring." The Digimon Reference Book is Bandai's official bible on the various Digimon species, first launched in 2007 and now comprising over seven hundred different Digimon out of the thousand-plus species that exist. It updates weekly with new Digimon profiles.